Thailand’s Chiang Mai stirs visions of green national parks, wildlife encounters and aerial adventures through the rainforest. But it wasn’t until I arrived that I realised the city thrives on independent and trendy cafés, bars, restaurants and food stalls. It’s almost like a Southeast Asian Brick Lane, mixed with European, Thai and Asian dishes, hot from the pan to satisfy any appetite. Based in the Old City in Moonmuang Road, I was drawn into the Ginger & Kafe at The House by its fairy lights and modern shabby-chic décor of wooden benches, cushions and bean bags. There’s often a confliction with a nice exterior and the quality of food, usually with the assumption of one or the other, but this place triumphed with both. Chiang Mai is known for its Pad Thai so I ordered mine with prawns, and a side of chicken dumplings with plum sauce. The Pad Thai was piping hot – which you want with any meal – and the flavours of lemon grass and ginger absorbed by the slightly salty noodles was heavenly. In fact, I couldn’t wait to eat it before my sister’s Pad Thai arrived, hence the cameo of the cutlery on my plate. The chicken dumplings were equally delicious and, after finishing them, we drizzled the plum sauce on to our Pad Thai which was served beautifully on a banana leaf. Chiang Mai is also a smoothie and juice lovers’ dream, so I couldn’t resist ordering a juice to wash the food down. I ordered the ‘My Green’ which comprised of apple, kale, banana and celery, and it came in its own glass bottle. 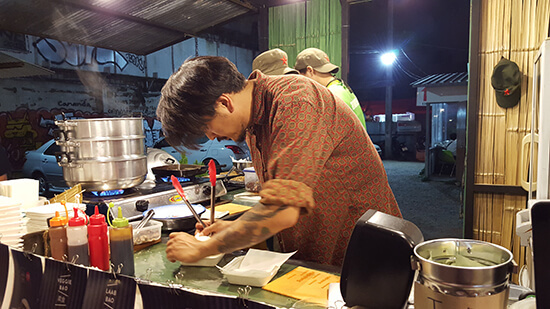 On the main road of the colossal Night Bazaar, near the charmingly named Pink Pvssy shop is the Ploen Ruedee Night Market. 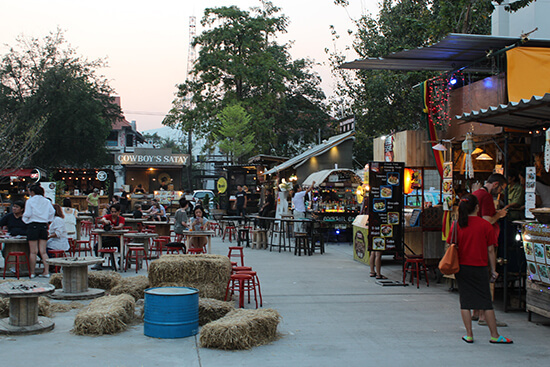 This hipster food court faces a live band, which plays to people sitting on hay stacks gorging themselves on their chosen meal or beverage from one of the many independent food stalls that frame the court. There is so much to choose from here: traditional Thai food; seafood; sushi; burgers; pizza; barbecued meats; cocktails; sangria; wine; and beer. This lively place is a bit overwhelming at first but just go by the queues. We chose to eat at the Chinese Mao Bao stall, and I ordered the beef bao. The tenderly-cooked beef was served in a steamed dumpling bun and slathered in a spicy Thai sauce. It was delicious and the sweet bun perfectly complimented the rich beef. Be ready to talk as well: we had lots of people coming up asking us where we had ordered our food from but that is all part of the fun. Fancy some lunch? Hidden away in the quiet Chaiyaphum Road is the Cat House, which came recommended by a hostel owner. This is another shabby chic café with wooden pallets taking the main stage. 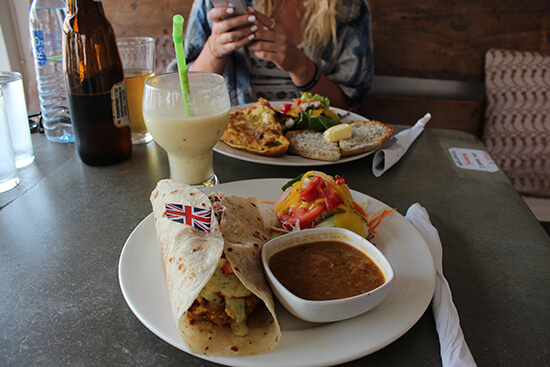 The smoothies here are lauded for tasting great, so I ordered a banana and passion fruit one which accompanied my western breakfast burrito – it’s okay to have a break from authentic grub sometimes – the burritos were spicy and the omelette inside was amazing. They do have Thai food available too, so you don’t have to feel like you are cheating. Down a side street from the main Night Bazaar Place, in Loi Kroh Road, is the trendy Lemongrass restaurant. Their motto here is ‘no view, but tasty’ as the vista really is just a road, but I encourage you take a plastic seat because the ‘no view’ part is just as true as the ‘tasty’ part. Here, I ordered a starter of fish cakes and mak-ta-sam curry with sticky rice. The flavours were phenomenal and the curry was lovely and creamy. It was so good that my heart broke when I felt full, as it meant abandoning this beautiful plate of food. I still don’t regret ordering the fish cakes though. Lemongrass has a thrifty wooden exterior completely covered in pen-written messages from previous patrons; if you ever go here, be sure to look for mine and Chloe’s contribution on the right side of the fridge. The staff are fun and helpful too, with a great sense of humour when it comes to how spicy you want your food. Top tip: always just say a ‘little’ because your spice threshold is nothing compared to the Thai’s. When you’re done, head back into the Night Bazaar Place and look up for the Boys Blues Bar, where you can enjoy a bottle of Chang Beer and live jazz music. 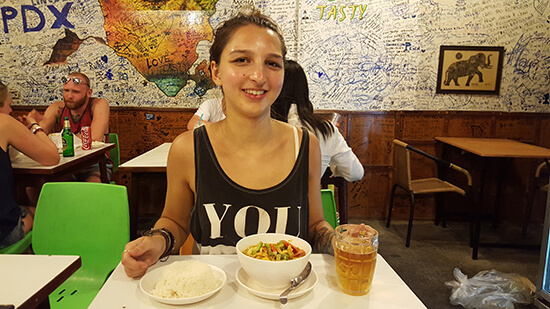 Has Helen kick-started your hunger for some Chiang Mai food? Speak to one of our Holiday Experts about arranging your tailor-made foodie holiday to Thailand today.